Please retract the editorial of April 10, 2009 titled “Predatory Brokers”. Please issue an apology to all mortgage brokers with the retraction. Please provide space for an op-ed to accurately and honestly describe the work of mortgage brokers to correct the false statements in the editorial, and to suggest how best to regulate the industry. What follows is a line-by-line examination of the 26-sentence editorial “Predatory Brokers”. I trust that after your review of my examination, you will concur with my opinion: The writer failed to grasp the basic facts and employed obvious fictions to denounce mortgage brokers. If you are like me, you will find this misuse of the editorial authority of the most powerful newspaper in the United States to be both horrendous and embarrassing. I have just begun to study this matter, but it is my opinion that the central misinformation of the “Predatory Brokers” editorial is based upon the writer’s use of an issue brief from The Center for Responsible Lending. The statements from the center that I have seen on yield spread, a payment from a lender to a broker, and the central issue in the editorial, are more fiction than fact. The editorial writer repeated those factual errors. The center is Jayson Blair and the editorial writer has repeated their obvious falsehoods to create and define his policy prescriptions for a major player in a $12 trillion industry. These two statements contain the central and obvious proof of the editorial writer’s failure to grasp the basic facts of the matters he is commenting upon. It is a primary proof that the editorial should be retracted and that an apology should be issued to mortgage brokers. I personally agree with the sentiment the writer states in this passage. I agree that many mortgage brokers do legitimate work. I consider myself to be one of the mortgage brokers that does legitimate work. The next sentence, sentence 10 of the editorial, says that “the fees they (mortgage brokers) get from lenders … are fully justified”. I also agree with that statement. Payments made by lenders to brokers are fully justified when good brokers do their job. What makes the statement embarrassing for the editorial writer and for the New York Times is that the fees the writer is referring to in sentence 10 are yield spread premium fees. The primary argument of the editorial is that “the most clearly unethical form of payment (to mortgage brokers) is the so-called yield-spread premium” (sentence 17) and they should be outlawed. In other words, in the same editorial, the writer has stated that yield spread payments “are fully justified” and that yield spread payments should be made illegal. There’s only one logical explanation. The writer didn’t understand yield spread. As you will soon see, that’s not a hard argument to prove. Nobody should take an editorial seriously which has committed this error, but 20 senators have. They are asking that the editorial’s call to ban yield spread be implemented. The whole world is growing dumb after reading The New York Times. If The Times editors are not aware of it, there is a fun game called “telephone”. Probably the editorial team should play this game as a team-building exercise and to help you discover the outside world. It really exists. It’s a place where reporters pick up the phone. And make phone calls. And talk to people on both sides of the story. I believe the editorial writer lost his way by depending upon an issue brief from The Center for Responsible Lending. The center’s brief is a short collection of falsehoods about yield spread, but a perfect starting place for a quick editorial by a writer who thinks he already understands the subject. 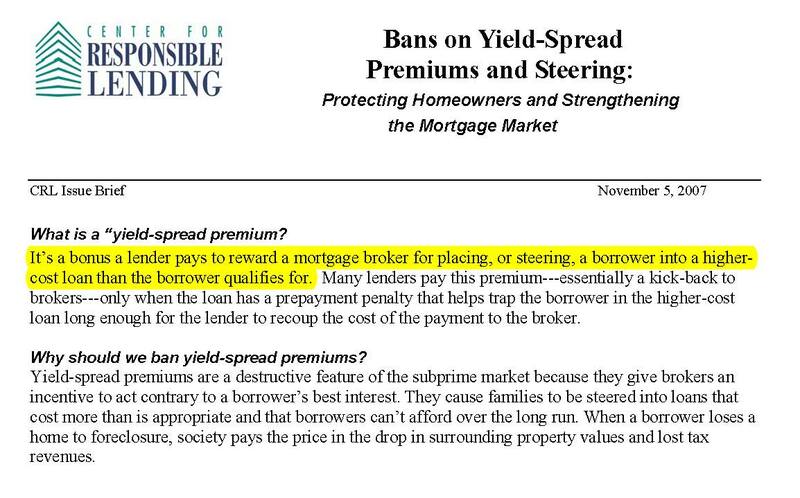 The Nov. 5 2007 issue brief by the Center for Responsible Lending states that yield spread is a “bonus” paid to a mortgage broker “for placing, or steering, a borrower into a higher-cost loan” (The issue brief is titled “Bans on Yield-Spread Premiums and Steering: Protecting Homeowners and Strengthening the Mortgage Market” — Click Here for Up-Close-And-Personal Details on the Center for Responsible Lending Issue Brief). The most important falsehood which the issue brief used, and the editorial writer incorporated, is the assertion that yield spread is a payment for a “higher-cost loan”. This is false. Yield spread is paid on almost all loans originated by brokers. Yield spread is paid if the loan is high-cost or medium-cost or low-cost or no cost. By describing yield spread as a fee only for high-cost loans, the issue brief and the editorial both legitimately argued that yield spreads should be banned. If they have both incorrectly defined yield spread, however, and if yield spread is paid on good, bad and indifferent loans, then a ban on yield spread would have the effect of taking away good, bad and indifferent loans. The ban on yield spread is in fact so draconian that it would bankrupt all mortgage brokers. Do you think you should have been aware of that when you issued your policy? If all mortgage brokers are bankrupted, then the role of small business in mortgage lending will be destroyed. If small business is destroyed in mortgage lending, then retail banks, the most expensive and slowest source of mortgage loans, will be the only choice consumers have. I provide further argument later in the paper that YIELD SPREAD IS THE KEY AND ESSENTIAL TOOL OF GOOD MORTGAGE LOANS. Until then, please trust me when I say the following: As a banking professional working as a mortgage broker, and as a person with 17 years of daily work in real estate lending and real estate investment, calling for a ban on yield spread is not very different from calling on a ban against words in newspapers. It is a statement of such shocking ignorance that for those who understand the industry, reading your editorial can and will destroy all faith and deference which a reader might previously have given based upon your reputation. I cannot imagine what people will think if you do not retract the opinion and issue an apology. For any person in my industry, you will forever be both a joke and a menacing influence promoting evil falsehoods. Right now it is only your editorial which is a joke. Failing to take responsibility for its errors will make the newspaper a joke. Yield spread is a fee paid from a lender to a mortgage originator. It is nothing more and nothing less. A lender who wants a new loan pays a broker a fee for a new loan. The fee the lender pays the broker is yield spread. Yield spread is a normal and ethical payment for a broker to receive. It could cross the line into an “unethical” payment if the broker charges too much for their services. That can be a problem. It is true that there were too many bad players in the business, but a huge section of them are already gone. I don’t think the editorial writer is aware that 380 major lenders including many brokers have gone out of business since the beginning of the financial crisis, according to The Mortgage Lender Implode-O-Meter, and a ton of unethical companies and players have been washed away in this blood bath. There were too many mortgage brokers who took advantage of the less educated and charged higher fees then they should. We cannot properly regulate this central fault unless we all know and share the basic facts of a mortgage broker’s work. Your editorial does not have the basic facts and cannot make appropriate policy recommendations. If you continue the analogy with a newspaper, and to provide some guidance to the general reader, yield spread is analogous to the placement fee that advertisers pay to appear in newspapers. Readers pay the newsstand price for a newspaper just as borrowers may pay points for a mortgage. Newspaper readers don’t have the slightest care or interest what advertisers pay to appear in the newspaper. Most borrowers don’t care about the yield spread payment – so long as the terms of their new loan are good. Lenders pay yield spread to mortgage brokers for a new mortgage investment. Advertisers pay publishers to place their business message in a newspaper. Can anyone imagine the disbelief of an editorial which suggested that advertisements should be banned in newspapers because they are a kickback from an advertiser to a publisher and readers haven’t been told the fees the advertisers are paying? Is the call for a ban on yield spread equally dumb? One thing is sure: If the ban on yield spread is enacted, most or all mortgage brokers will go out of business because they can no longer do good mortgage loans. Banks will still have the ability to charge yield spread and to do good loans. All business will shift to them. Yield spread is paid on high-cost, medium-cost, and low-cost loans. Banning yield spread, which is the policy of both The Center for Responsible Lending and The New York Times, that ban would have the effect of banning medium-cost and low-cost loans. The clear objective of your editorial is that something should be done to stop high-cost loans to borrowers who should have low-cost loans. We know the editorial writer did not understand what yield spread is because in the same editorial he argued against high-cost loans but he did not comprehend that a ban on yield-spread would make all mortgage-broker loans high-cost loans. His policy prescription accomplishes the opposite of his goal: If you ban yield spread, you mandate high-cost loans for any mortgage originated by brokers. What the opinion writer could reasonably have argued is that mortgage brokers should not charge an excessive amount of yield spread. He cannot argue that a yield spread fee is “fully justified” and that new legislation “would rightly make yield-spread premiums illegal” (sentence 22 of the Times editorial). The even more disturbing truth which the New York Times editorial hides is that YIELD SPREAD IS THE SMARTEST WAY FOR A CONSUMER TO PAY FOR THEIR MORTGAGE. I make that case here and now. I will make that case with the assembled editorial staff of the New York Times. I will make that case with every borrower I talk too. I will make that case to the world. I will make that case because I know what I am talking about and I have been part of hundreds and hundreds and hundreds of mortgage loans and the editorial writer hasn’t the slightest idea how mortgage lending works. The reason I encourage borrowers to use yield spread to pay for a loan is obvious. Let’s review a few examples with real world numbers. If we are dealing with a $200,000 loan which costs $6,000 to the borrower, the borrower has the choice of paying the $6,000 himself or the borrower can elect to have the lender pay the $6,000. Let’s look exactly at this choice so we understand exactly what we are talking about. I’m going straight off a rate sheet dated Feb 1, 2010. These are real numbers. The borrower has a choice between a loan of $200,000 at 5.4% or a loan of $206,000 at 4.875%. The first choice, the $200,000 loan, pays the broker 3% of the loan amount with yield spread — a fee generated by the increase in the interest rate from 4.875% to 5.4%. The loan costs the borrower nothing because a mortgage of 5.4% is worth more to the lender than the mortgage at 4.875%. The lender pays the 3% fee. The monthly payment is $1,123. This is the choice that a ban on yield spread would outlaw. It is a free no-cost loan. The editorial says that it wants its policy to stop high-cost loans, but their policy in fact mandates high-cost loans. In the second choice the borrower pays the broker and close costs of $6,000 by adding that amount of money to their loan. His interest rate is better because he is paying the $6,000 and the lender can afford to give him a better rate. The borrower’s rate under this choice is 4.875%. The monthly payment is $1,090. Which one do you prefer reader? If you use yield spread, your monthly payment is $33/month higher, but your mortgage balance is $6,000 less. If we ban yield spread, and we force clients to pay points and closing costs themselves, then in this case it will take the borrower more than 15 years to make the $33 monthly savings pay off ($6,000/$33 = 15 years). There is barely one fool in the world who will pay the points and wait out the 15 years it takes to make this loan make sense. And if you forced 100 fools to make such a choice, it is unlikely even one would attain some financial benefit by paying points. Yet the New York Times editorial argues not just that the borrower have the option of paying the points and closing costs, they argue that the borrower MUST TAKE THIS OPTION. Banning yield spread requires borrowers to take out high-cost loans if they use a mortgage broker. Let me repeat the obvious. The editorial is arguing that borrowers be forced to take the bad option which is the expensive option even though the point of their policy is to reduce high-cost loans. Because borrowers will not take the bad option, they will move their business to retail banks. Mortgage brokers will all go out of business. Nobody who understands yield spread would argue for it to be banned. That is why it is so critical for the New York Times to retract its opinion, issue an apology to all mortgage brokers and provide full space for a complete rebuttal. If any reader thinks that ignorance cannot rule this world, please take note that The Center for Responsible Lending, the group which argued for a ban on yield spread, it released an issue brief on August 31, 2009, saying that the Fed has issued a final proposal saying that mortgage broker fees “would not increase based on changes in the interest rate.” Changes in interest rate is the way brokers charge yield spread. The real world implications of this nonsensical editorial are real. A group of prominent senators has just written a letter calling for a ban on yield spread. Guess who is the source of intelligence on this strange public policy proposal (read the letter here)? Look above at the example. The mortgage broker changed the interest rate from 4.875% to 5.4%. The Fed proposal would ban fees “based on changes in interest rate”. It’s true that the borrower added $33 to their monthly payment to reduce their loan balance by $6,000. They didn’t want to wait 15 YEARS for the monthly savings to pay off and they didn’t want to add $6,000 to their loan balance. EVERY MORTGAGE CUSTOMER SHOULD INSIST THAT THEIR MORTGAGE BROKER PAY FOR THE ENTIRE TRANSACTION WITH YIELD SPREAD. I call attention to my opinion with block letters because I am proud of all the mortgage transactions which I have originated which were paid for entirely with yield spread. That means the lender paid for the loan and the borrower received an acceptable rate and the borrower paid nothing for that privilege. The writer of the editorial has no awareness that this is the smartest and the best way for a consumer to take out a mortgage. Who do you think is right? Is it me? Is it the editorial writer? Is it the creature from the black lagoon? It’s not just my opinion based upon 17 years of real estate lending and a complete and full mastery of the subject matter discussed here. It is also the assertion of the academic research which has been written on the subject (but obviously not including the paper from The Center for Responsible Lending). The center should join Jayson Blair in New York Times history. The editorial writer has used the work of a terrible reporter or a deceptive reporter or a mass murderer. Do you wonder where the editorial writer got this thought? Listen to this. Yield spread is a “bonus a lender pays to reward a mortgage broker for placing, or steering, a borrower into a higher cost loan than the borrower qualifies for” and the payment is “essentially a kick-back” (“Bans on Yield-Spread Premiums and Steering: Protecting Homeowners and Strengthening the Mortgage Market”, Nov. 5, 2007, The Center for Responsible Lending). Both statements are so factually erroneous that it merits special attention. I will mention briefly again that in sentence 10 the writer said the “kick-backs” paid by lenders to mortgage brokers are “fully justified”, but he didn’t know he was talking about the kick-backs when he said that. Yet in sentence 13 he argues that the kickbacks paid by lenders should be outlawed. 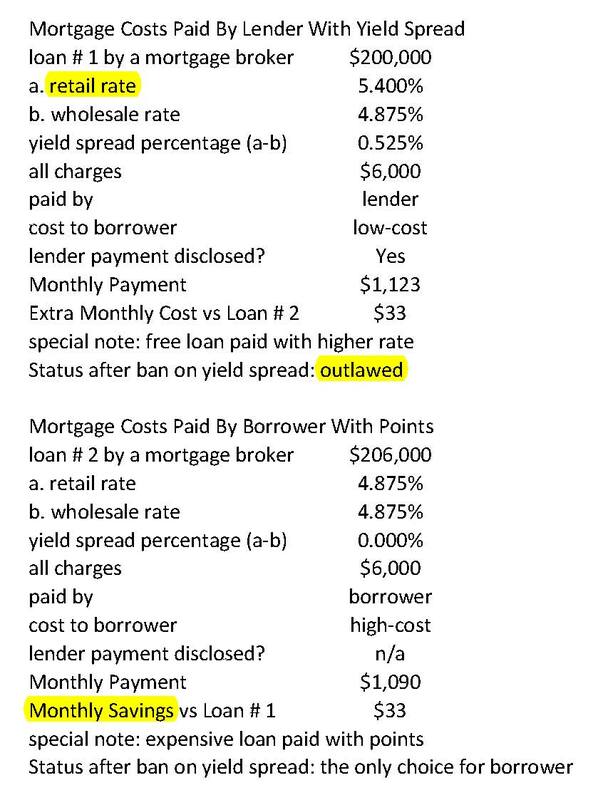 Sentence 13 also contains the erroneous assertion that yield spread is paid on “costlier” loans. Yield spread is paid on costly loans, cheap loans, and all loans in between. Almost all of them anyway. I do not remember a single loan I have done which did not include yield spread. I can’t imagine any circumstance in which it would be smart to exclude yield spread. Yield spread allows mortgage brokers to provide low-cost loans. Since it is the goal of the New York Times editorial policy to promote low-cost loans, it must then embrace yield spread. A low-cost loan requires the use of yield spread. The editorial is backwards on how to accomplish low-cost loans. Yield spread is a payment by a lender to an originator. It is ethical for a lender to make a payment to an originator because the originator has worked for their payment. The jobs which the originator is paid for include finding the borrower, finding the best loan for the borrower by checking with different lenders, explaining different options to the borrower, organizing the paper work for the borrower, submitting the loan application, and arguing on behalf of the borrower when the lender does not want to approve the loan. All of these jobs performed by an ethical originator are an ethical source of the ethical payment they earn from the ethical lender who makes ethical payments to ethical originators based upon the ethical use of yield spread. The writer of the editorial does not define a kickback in sentence 13, but I define it as an undisclosed payment. If an undisclosed payment is the definition of a kickback, and that is a primary definition of “kickback” under RESPA, the key body of law which defines the work of mortgage brokers, then yield spread is by definition not a kickback. Yield spread is by definition not a kickback because it must be disclosed and it would be illegal if it is not disclosed. Why does the editorial writer believe that yield spread is “the most clearly unethical form of payment” and a “kickback” even though the payment is fully disclosed? It’s simple. He copied somebody else’s work. Yield spread, according to the Center for Responsible Lending, is “a bonus a lender pays to reward a mortgage broker for placing, or steering, a borrower into a higher cost loan than the borrower qualifies for” and “Many lenders pay this premium—essentially a kick-back to brokers“ (“Bans on Yield-Spread Premiums & Steering: Protecting Homeowners and Strengthening the Mortgage Market” Nov. 5, 2007, Center for Responsible Lending). Do you believe the editorial writer who says yield spread is “fully justified”? Or do you believe the same editorial writer in the same editorial saying that yield spread is “the most clearly unethical form of payment” and the “reward” for “bleeding unsuspecting borrowers” and that pending legislation “would rightly make yield-spread premiums illegal”? Does anybody think the New York Times editorial makes sense? The special irony of the editorial writer’s factual mistakes is that there is an entire segment of players in mortgage origination who do receive kickbacks – if we use the definition from Respa which defines a kickback as an undisclosed payment. All retail banks sell their loans in return for payments called “release spread premium”. To a borrower there is no difference between a broker who earns yield spread and a bank which earns release spread. Except for one thing. MORTGAGE BROKERS ARE REQUIRED TO DISLCOSE THIS INCOME. RETAIL BANKS NEVER DISCLOSE THIS INCOME. The institutions which earn kickbacks are retails banks. Retail banks don’t disclose their income. Which practice is more ethical? The practice of those who disclose or the practice of those who do not disclose? Which practice is more like a kickback? The practice of those who disclose or the practice of those who do not disclose? If we define a kickback as an undisclosed payment, then retail banks are earning “unethical” kickbacks because they do not disclose their release spread premium. Yet the Times policy would shift all mortgage business to the “unethical” retail banks who hide their “kickbacks” legally (Please see the example below.). If the editorial writer understood this basic failure in our regulation of the industry, and if he actually knew what a kickback is and how to define it, then he would have been aware that mortgage brokers are required by law to disclose more fee information than retail banks. Anybody with a basic knowledge of mortgage origination is aware of this fact. The editorial writer should apologize for getting this industry fact backwards. And the New York Times should conduct an investigation of The Center for Responsible Lending. Is their work paid for by major banks – the lenders that don’t disclose their fees? How could any serious academic institution butcher the facts so badly? The most likely scenario, based on a guess, is that they are a liberal group with great faith in their objections to the work of mortgage brokers and they don’t care about the integrity of their name or their work. They must know that retail banks get kickbacks and not mortgage brokers, but if you say mortgage brokers get kickbacks enough, then the New York Times and 20 senators who don’t know what they are talking about will call for a ban on yields spread because it is a kickback. “Brokers can claim this premium (yield spread) by steering a borrower whose credit history qualifies him or her for say, a 7 percent loan, into a more expensive loan at a higher rate” (sentence 18 of the editorial). This statement misleads the reader because it implies that yield spread is only paid if a borrower takes out a “more expensive loan”. The obvious intention of the editorial writer was to say that mortgage brokers should provide the best loan available to their client. Mortgage brokers should not be given a greater financial reward for giving their clients a less favorable loan. The classic example of this malpractice is putting a borrower into a arm loan with an adjustable rate when they could qualify for a fixed rate. All good mortgage brokers agree that mortgage brokers should be required to give their customers the best loan available. Good mortgage brokers are not only willing to live by this rule, they want that rule. Mortgage brokers should provide their clients with the best loan available. We should banish brokers who do not follow this rule. In the editorial, the writer falsely claimed that yield spread is the reason mortgage brokers move clients to more expensive loans. If he had understood yield spread and the mortgage business, he would have stated that brokers should not be paid a greater amount of yield spread for putting their clients in to a lesser loan – a loan that costs more. I restate my opinion again on the matter: There is nothing wrong with being paid with yield spread. I always advise clients to pay for their mortgage with yield spread. Always. I am proud of that record. I understand what yield spread is. The editorial writer does not understand. The editorial writer wanted to say that there is something wrong with being paid more yield spread for a lesser loan. Any law or regulation which enforced that sentiment is a rule which good mortgage brokers embrace. If the New York Times editorial writer had understood yield spread, he could have reasonably made such an argument, and it would have made sense. In this case he is senseless and so is his newspaper. And that’s just the beginning. “A House bill introduced by Representative Barney Frank, a Democrat of Massachusetts, would rightly make yield-spread premiums illegal.” (Sentence 22 of the editorial). Obviously, at this point of my story, any person in my industry is both outraged at Rep. Frank’s House bill and they are on the floor laughing hysterically at the comedic intersection of errors shown here in the Barney Frank, Center for Responsible Lending, New York Times ménage a trios. While mortgage brokers have taken a very heavy beating from the press, there are millions and millions of mortgage broker customers who both like their mortgage broker and know their broker got them a great deal – a much better deal than they would have gotten from a retail bank. When a friend needs a loan, they refer that friend to their mortgage broker. Please use the following message in the subject box: Ban Yield Spread and Die Yuppie Scum Eater. The editorial writer and The New York Times and the Center for Responsible Lending will want to reconsider their opinion about Rep. Frank’s bill in light of the new information provided here. If there is still in fact such a bill, it would only have been written by a person who does not understand what yield spread is. It might have been written by a person who read the New York Times editorial and took it seriously. As it so happens, a group of important senators have written Fed Chairman Ben Bernanke. And do you know what they asked for? They asked for a ban on yield spread. The senators also said that a ban on yield spread will end global warming. If a pre-payment penalty is included in the new mortgage, banning yield spread will guarantee world peace. Let’s do this now before there is a change in the astrological chart. I’m serious. The stars are good right now for this consistent, smart, sensibly-conceived policy. Yield spread is a payment made by a lender to an originator. The payment of yield spread is both ethical and borrower-friendly and smart and the choice that all borrows should choose when paying for their new mortgage. The existence of yield spread does not create an unfair advantage for a mortgage broker. Dishonesty creates an unfair advantage. Any borrower can easily defeat a dishonest broker: He calls somebody else and asks for a second opinion. “What will you do this loan for and how much will it cost?” That’s all we need to do to stop bad brokers, although I have zero qualms about more serious regulation. Banning yield spread would destroy mortgage brokers and their ability to provide good loans. Legislation should not outlaw yield spread payments from a lender to an originator. Those concerned about predatory mortgage brokers should use some other method to police the industry. I have some thoughts about how it can be done correctly. If legislation outlaws yield spread, it will bankrupt all mortgage brokers and force all mortgage business to retail banks. The retail banks will continue to charge their version of yield spread, and they will continue to keep knowledge of the charge to themselves – meaning the people who earn kickbacks will be aided by the Times policy. It is also true that borrowers will lose their best mortgage resource. Brokers beat the pricing of retail banks all the time. Why do they provide better mortgage terms? Mortgage brokers are smarter, faster, better, cheaper. The Times policy is against mortgage lending which is smarter, faster, better, cheaper. Do you want to see some academic research on yield spread? Please see the paper titled “Do Borrowers Make Rational Choices on Points and Refinancing?” by Yan Chang and Abdullah Yavas. A press report on this paper says that 1.5 percent of borrowers who used yield spread to pay for their loan would have been better off using points. If you told the New York Times editorial writer that his ban on yield spread would force 98.5% of borrowers to choose a more expensive and less affordable loan paid for with points, he would have looked at you as if you had said a unicorn is green with a white horn. Why? He didn’t have the slightest idea that there are only two choices for the borrower: pay with points or pay with yield spread. There is nothing else. In other words, in almost all cases, the use of yield spread is not only ethical, the use of yield spread is smart and cheap and the best choice for consumers. In my personal practice of mortgage brokering, I always instruct borrowers to pay my fees and all close costs with yield spread when possible. I am proud of making a point of always providing that intelligent advice to all of my customers. The New York Times has committed grave errors in its April 10 2009 editorial titled “Predatory Brokers”. Please retract the entire editorial. Please issue an apology to mortgage brokers. And please provide an op-ed space to explain how our work works. If borrowers and lawmakers depend upon your editorial, they will be mislead, confused, deceived. We can already see that 20 senators have called for a change in regulation based upon your errors. You have called for yield spread to be outlawed in the same editorial where you described it as “totally justified”. You have argued against “high-priced” loans, but your policy would have the effect of requiring that all brokered loans be high-cost mortgages paid with points. 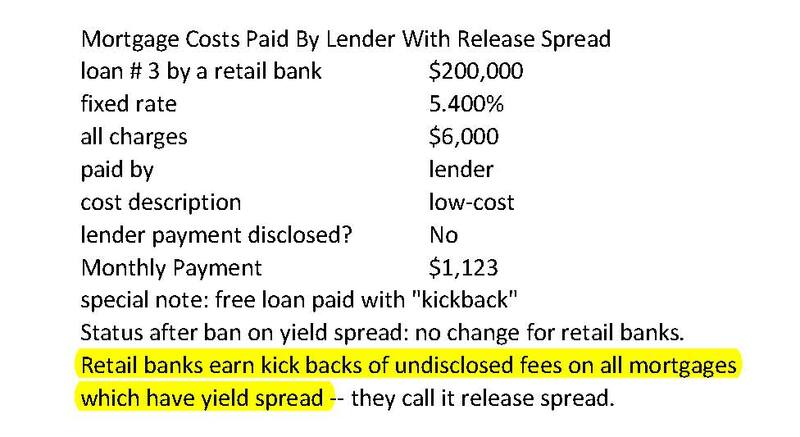 You have argued that yield-spread is a kick-back paid to mortgage brokers, when our industry defines kick-backs as undisclosed payments, and yield-spread is always disclosed. Yet your policy would have the effect of steering all mortgage business to retail banks. Retail banks can rightly be said to accept kick-backs for their work — because they don’t disclose the payments they receive from lenders. Your current policy promotes kickbacks and “high-priced” loans – exactly the things which you don’t want. Anything less than a complete retraction and full apology would be an unethical bonus kickback paid to the forces of predatory ignorance. You have already contributed far too much to the forces of ignorance. My opinion is that your massive errors in this editorial prove your prejudice against free markets. Any sensible commentator would have asked themselves: How should brokers get paid? You wouldn’t ask that question if you think it is immoral for people to be paid for their work. I admit the charge is broad, but I back up the charge with the factual falsehoods of your editorial against yield spread and the work of mortgage brokers. You have shot yourself in the foot and the stomach and the mouth. You have destroyed your credibility on this subject. Retract your rank plague-filled abortion. Retract it or disembowel yourself from the body of honest newspapers.